The idea of a black man joining the notoriously racist Ku Klux Klan certainly sounds farcical and mildly comical, but that’s exactly what happens in the movie “BlacKkKlansman.” Directed by Spike Lee, the film is based on the book by Ron Stallworth, a black detective with the Colorado Springs Police Department who posed as a member of the organization to infiltrate the Klan. Stallworth, while undercover, managed to setup a meeting with the Klan’s Grand Wizard David Duke, even successfully taking a polaroid shot with the white supremacist. 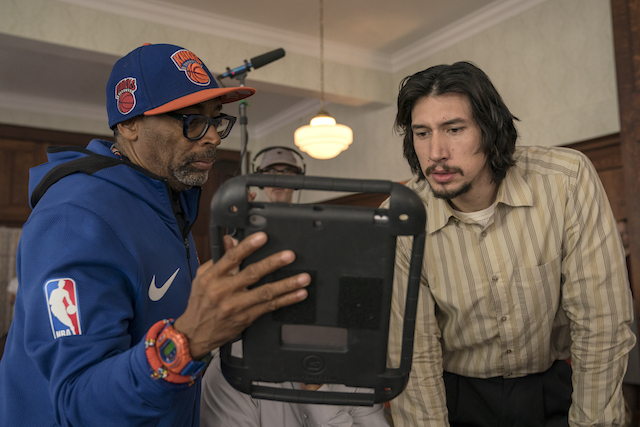 (l-r.) Director Spike Lee, actors Topher Grace and Adam Driver on the set of Spike Lee’s BlacKkKlansman, a Focus Features release. Like many of Spike’s films, “BlacKkKlansman” shifts between intense drama and scathing satire. With just a few minor changes, Spike sticks closely to Stallworth’s book, documenting his start with the force as a young hungry police officer eager to rise up the ranks to his subsequent role as an Intelligence Unit Detective. It was a chance call he made in October 1978 while scanning the daily newspaper for subversive activities that he came across a Ku Klux Klan posting. Using his real name, he answered the advert and received a call from the Colorado Springs Chapter of the KKK. After successfully convincing the caller that he was a white man with an adverse hatred for folks of color, he was eventually initiated into the clan and started investigating the group’s activities. It’s an investigation that ended up stopping an assassination attempt by the Klansmen and several planned cross burnings in the city. It also outed several federal employees who were KKK members. It’s a film which hits theaters on the one-year anniversary of the White Nationalist rally in Charlottesville that claimed the life of counter-protester Heather Heyer. 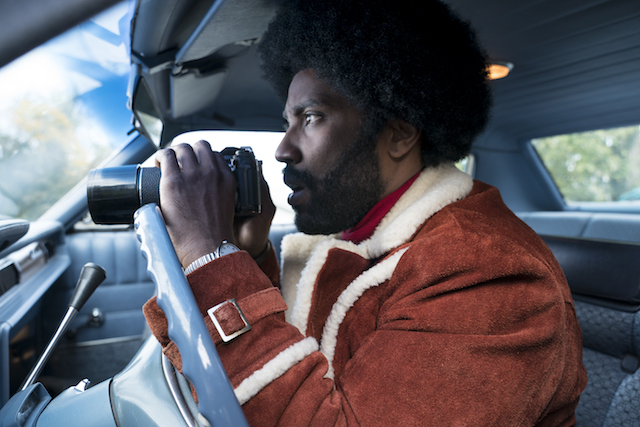 In this screen adaptation, Stallworth is brilliantly portrayed by John David Washington (“Old Man and the Gun”), while Adam Driver plays his white colleague, Flip Zimmerman, who impersonates him during physical meetings with the Klan. Laura Harrier plays Stallworth’s love interest Patrice, the head of Colorado Black Student Union who meets him when he goes undercover to attend a talk being delivered by Stokely Carmichael (Corey Hawkins) and Topher Grace rounds up the main cast as David Duke. With a running time of 135 minutes, Spike splashes a little humor on a delicate subject and his execution of Stallworth’s book is commendable as he weaves comedy into the fabric of tough tale to help relieve some of the incredible tension. There are huge afros, embroidered blouses, bell-bottoms, midi skirts and maxi dresses and he pokes fun at the Klan never losing an opportunity to show them as narrow-minded bigots as he delivers a true-life examination of race relations in 1970’s America. Produced by the team behind the Oscar-winning movie “Get Out,” the exchanges between Stallworth and Duke are shocking and almost comical as Duke denounces blacks and their speech patterns never realizing he’s speaking to a black man. Spike also handles the harrowing KKK initiation scene in which a crowd gleefully cheers during a screening of 1915’s “The Birth of a Nation” with care and caution juxtaposing that scene with Harry Belafonte as Jerome Turner recounting his first-person recollections of the 1916 lynching of Jesse Washington. In more than three decades as a filmmaker, Spike Lee has tackled topics from college fraternities, Malcolm X, the Son of Sam murder spree, the British Petroleum oil spill to the gun violence in Chicago and always engages audiences without overwhelming them. His films often straddle the fine line between tragedy and comedy and audiences will certainly be entertained by Stallworth’s inspirational life-story and the film’s timeless subject matter.